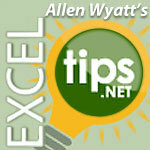 Learn to specify a different default file format for your Excel files. 2 simple steps to add an Excel chart to a worksheet. A quick, easy way to remove hyperlinks without a macro. How to take advantage of Excel autofill variations with a right click. How to use different formatting to differentiate the odd numbers from the even numbers. David would like to create a chart that could be dynamically changed to show the sales for a single company from the worksheet. This simple key combination will delete rows and/or columns in Microsoft Excel. Step by step instructions to delete conditional formatting in a Microsoft Excel worksheet. Excel normally sets the height of rows within your worksheet to reflect the size of the largest font used on the row. You can, however, adjust the height of the row to any size desired. Excel users are always looking for ways to speed up large worksheets. If you are using a large worksheet that has lots of static formulas in it, this tip may be of help to you. Excel has a handy scaling feature that allows you to specify how many pages you want your printed output to occupy. Learn to configure how information should be oriented within a Microsoft Excel cell. How to make Excel jump to the end of the real data. How to include a bitmap image on a Microsoft Excel form that changes according to a variable. As you use the spell-checking capabilities of Excel, you undoubtedly have added words to your custom dictionary. Excel includes a spelling checker that you can use to proof the text in your worksheets.